I read that it non-negotiations was only for initial employment, not promotions or transfers. I would likely still interview there to see if they had a competitive package. I would interview other places as well. This would not keep me from interviewing, but it will make my initial response to an offer simple. You either are or are not competitive. Agree with Sumner. I’d rather know what was on the table up front before wasting my time and theirs, and not saying to myself ‘well if I had an MBA and were a different this or that’ I would have gotten more. As long as the rest of their process is straight on and honest, it would make a big difference to me. I’ve also been in exactly the opposite–a small company situation where a recruiter dangled major money range in front of me, I went through multiple interviews with C-level, then when it came to offer time the recruiter then the small company CEO told me it was 20% off and reduced title, and I could not get a penny more, that the salary ‘is what it is’. I wound up negotiating I thought successfully for more on the ‘soft’ side including the original title—15 minutes after the second draft of the contract was signed by me, they pulled the offer. The best jobs of my life had minimal negotiations. What was on the table was fair and upfront. Not everything has to be a Turkish bazaar. It gets tiresome. SO does Ellen Pao expect her procurement managers to NOT negotiate prices for goods and services needed by the company to carry out its everyday activities? Am I to believe that she is not interested in containing and controlling costs through cost improvement and containment actions? After all Ellen, just about everything is negotiable these days and that includes such little inconsequential things like salaries, benefits, extra time off, better offices, etc. Does Reddit NOT negotiate the cost of healthcare for its employees? Do you NOT negotiate for office supplies. toilet paper and so on? Ellen Pao proves her unsuitability for HER role as CEO by the mere fact that she arbitrarily denies salary negotiations. How about I not negotiate the next Software Renewal package with SAP? That won’t interfere with my next review will it, Ellen? Why anyone, male or female would want to work for a company with such an obtuse leader is beyond me. Rest assured, I and most of the folks I know will NOT be applying to Reddit anytime soon. But can you negotiate for other things, like PTO, flex hours (family friendly) or that vacation you were due to start a month after you started that Reddit job? Or is she the new Soup Man? ‘No Soup For You’! Ah yes, this is the same Ellen Pao who lost the gender discrimination lawsuit against VC Kleiner Perkins. She’s gotten quite a bit of publicity on that, though she got a kick in the pants in court. Now she gets to institute her own little experiment. Well, we will see. Of course, given the hot SF/Silicon Valley employment market in her company’s sector and needs, a refusal to negotiate for talent might put Reddit at a MAJOR disadvantage. I wonder how women will really fare at Reddit, salary and negotiation aside, given the frat boy ambiance of most internet companies. Let’s not even talk about ‘affirmative action’ in favor of older talent. I doubt Ellen would discriminate in their favor to get some ‘age balance’! All that said, I’ve never gotten a win when the job negotiation starts in a ditch and you try to pull it out. It tells you where they are–six months, a year, five years later, you’ll be battling to be treated fairly. It’s different when you’re negotiating for the company to get the best deal, the best price. Then it’s not personal, you’re battling on behalf of, and that’s part of the job. Another factor with that small company I mentioned was that I was a woman negotiating on my own behalf with men who, to put it mildly, had a cultural prejudice against women. (No, this was not 1965, either.) I had gone through that in another company with a similar cultural bias, accepted the offer needing the paycheck, and was poorly treated from the moment I walked in the door. I think everyone knew from the CEO the circumstances of my hiring. I hated every moment but benefited from the experience in the long run–and let’s say that remaining in that sector, on occasion I’ve enjoyed a fine, cold dish of revenge. I was determined not to have that kind of mistreatment happen ever again. After rounds of interviews, a long selection process, and then you make it through, is it too much to expect a fair job offer to start with rather than more rounds of hondling? Negotiate a few things, they’re happy, you’re happy, here’s your date, you start. I’ll bet anything that Ellen Pao negotiated her own salary when she was talking to Reddit about being their CEO. The soft bigotry of low expectations. And if I were a woman, I’d be insulted. I don’t know how good she is at her job, but Ellen Pao is exceedingly good at one thing–milking publicity on this issue for ALL that is it worth! And if she doesn’t perform, she’ll be screaming that the ‘boys did her in’ etc. trailing her very large and golden parachute behind her. Just another socialist experiment that will eventually fail. Capitalism is a brutal business but it’s the best business. Only the strong survive and the weak accept what others offer and in this case that is all that your going to get. She will end of with a staff of campers with no climbers in site because climbers do what campers don’t do – the actual work! The climbers that succumb to accepting a position will look around the office after working 70 hr work weeks and wonder what the heck am I doing? They’re making the same amount of money as me and I do double the work! Get the picture? And out the door the climbers will go looking for a place where they can actually climb. One way to look at this is positioning. Let’s say you apply, or are presented by a recruiter (hopefully a good one). When you fill in the box for current salary, put that. If you can put vacation, benefits and bonus in there, add that. In the box where it asks “salary desired” don’t put a number. Type in “open”. During the phone interview, when they ask you again, let them know it’s impossible to give a number when you don’t have enough information about the job, the culture, your boss, their benefits and the other aspects that I call the “entertainment factor”. Go for it and perform well enough to be asked to phone interview. When that gets set up, ask for the salary range. If it’s below your total comp, you may want to stop right here. If you learn it could be step up in some way, not necessarily straight salary, at least all is on the table. If the attitude of Reddit is “we’re so good we don’t need you” then that’s another story. No company is that good. The first thing that comes to mind: How about offering a fair salary/benefits in the first place? Or even going above and beyond what your competitors are doing? That is why people negotiate in the first place and why Nick has written extensively about not sharing your current salary, among other things. You all miss one very salient point. Pao has drawn a line in the sand that says “NO NEGOTIATIONS” for salary. My guess, while hypocritical and actually quite STUPID, it is the warning any reasonably intelligent applicant needs to determine whether or not you want to work for this organization. For me, it is more than enough. There is NOTHING about Reddit that would mean enough to me to even consider working under such tyrannical and egomaniacal management. NOTHING. My suggestion to any and all: “Move along, there’s nothing to see here.” Sooner or later, when the talent pool dries up or tires of this petulant child’s games, she’ll change her mind, the Board will fire her or something else will happen to change Reddit’s policies. @ Dave the top 5% is not the definition of the purple squirrel. The purple squirrel is the euphemism for the perfect candidate and as well inherently know, there is no such animal. I suppose one could get outraged, but I consider this fantastic transparency. Your value to the company’s bottom line is that which is dictated by the process, formula or whatever. Period. Super. So the people who you might hire to negotiate on your behalf are already marking Reddit off the list (marketing, sales, partner business development). After that, what’s left? Operations? Developers? Do they pay people for those “AMA” events? Let the experiment run, I say. I’ll be busy making sure my hiring managers aren’t playing to gender role stereotypes. It’s harder work, but then that’s why it comes with a paycheck. @Sumner: I think that’s a reasonable way to approach this, because it puts you in control by managing your expectations. However, I find it completely incomprehensible and totally inconsistent that Pao permits negotiating in one case, but not in another. This whole thing looks like a publicity stunt that she did not think through very carefully. @Dee: Your example about the employer who offered less than was suggested by the recruiter is just another inconsistency in employer behavior. 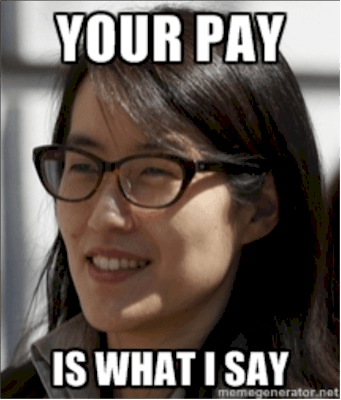 @Dave: It didn’t occur to me, but I wonder if Pao requires job applicants to disclose their salary history. Which, as you point out, they should never do. That might put a whole new twist on the motivation behind her policy. If she knows your salary history (let’s say it’s not high, and you feel you’re worth more) and refuses to negotiate, then she’s really got you over a barrel if she’s looking for a bargain. @Peter Kraatz: A wonderful assessment! You’re right – Pao can do what she wants, and she deserves credit for one thing: Being transparent. If she were to disclose this policy to applicants only at the offer stage, that would be improper. Having acknowledged that, we’re left with the consequences for Reddit, because any job seeker can also do what they want once they learn about the Reddit policy. Now, why didn’t Pao think of that? So let’s assume the study Pao cites is correct, and women are abused – by both men and women – when they negotiate assertively. That’s a bad thing. If Pao’s new policy is a poor one, what’s a better way to address the problem? Ellen Pao does the best of playing to gender role stereotypes with this move, don’t you think? @Claudia: Yes, and I think she’s either shameful about it or not very smart. If she were very smart, I think she’d see the contradictions in what she’s doing, and the shortsightedness. I couldn’t believe the negotiation ban idea came out from a Harvard MBA and Doctor in Law graduate! It’s no different than a Master-Slave relationship in which the Master pays the slaves whatever that is deemed fit by the Master. @Nick: Appears Pao is the “dumbo”, in addition to assaulting women’s slight gains. But, of course, this occurs after she’s gootten hers. Just another self-absorbed “achiever”?? Reading this, I can’t help thinking of auto dealers that advertise “no-haggle” sales — nearly always a bad deal for the buyer. The biggest thing for me here is that I would never ever want to work for someone Ellen Pao. It may not be fair, but I have a feeling that her “quest for diversity” means that I’ll be discriminated against at her company. When I don’t get that promotion and a woman (or a minority) gets it, I don’t want to walk around worrying about if me being a white male had anything to do with it. Basically, I don’t want to work for a company that cares about the color of my skin, or what I look like between the legs. I know never to apply to Reddit for a job. Ellen Pao is setting women back instead of moving forward. Women should be teaching other women how to negotiate a job offer, not just salary. I do agree with one point though she made about women who negotiate come across/are perceived as too aggressive. I have certainly been told in a job offer negotiation, that I was too demanding and aggressive. I wasn’t too demanding, just asking what the market value was for the job and what I can do for their bottom line based on my outstanding sales records. I once had a group interview and the hiring manager gave me feedback and told me that I am “too confident” and that came across to the younger people in the company as “stuck up”. I couldn’t believe it when I heard that. I only thought they should be lucky to have me on their team and the younger people were just afraid I would make them look bad if I can on board and surpassed their work.